The world takes a toll on our mind, body, and soul. A retreat offers us the time and space where the spirit is no longer under siege. A place where you can sit quietly, breathe deeply, and rest completely. That place is Westerbeke Ranch. Surrounded by rolling grass hills and vineyards in Sonoma’s Valley of the Moon, you can walk the garden paths, warm your hands in front of the “walk-in” stone fireplace, take a dip or hot tub in the sapphire pool, get a massage, and feast upon abundant farm-fresh cuisine. 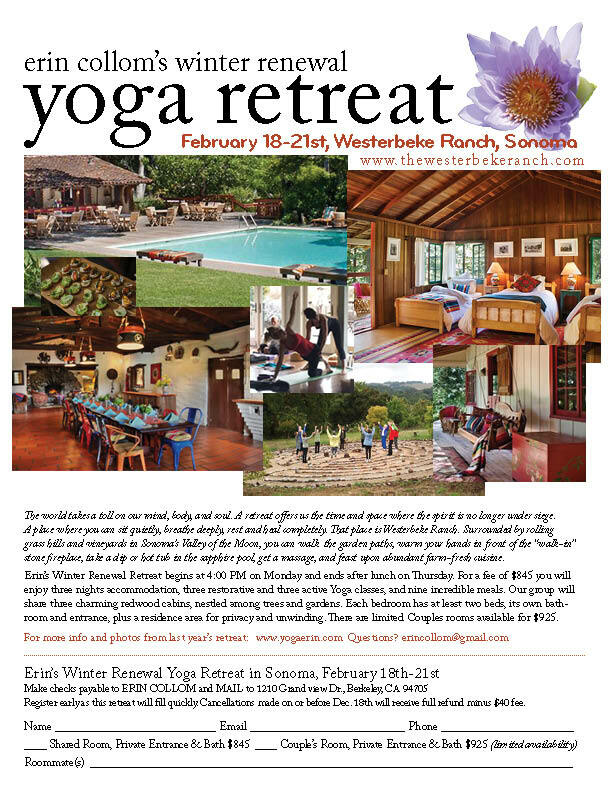 Erin’s Winter Renewal Retreat begins at 4:00 PM on Monday and ends after lunch on Thursday. For a fee of $845 you will enjoy three nights accommodation, three restorative and three active Yoga classes, and nine incredible meals. Our group will share three charming redwood buildings, nestled among trees and gardens. Each bedroom has three beds, its own bathroom and entrance, plus a residence area for privacy and unwinding. One bedroom has four beds. There are limited Couples rooms available for $925.